Welcome to the Loyalty Rewards Program! This program is our way of rewarding you for making Collier Harley-Davidson® your choice for all things Harley-Davidson®. This program is offered to all customers at no cost, subject to the program terms and conditions. Points are available through purchase and bonus points are available for special events. You will receive 1 point for every $1.00 you spend at Collier Harley-Davidson® in Parts, MotorClothes® and Service (excluding taxes, on-line purchases, and certain service procedures including, but not limited to, inspections, collision and warranty work, see store for details). If you are a member of our local H.O.G. Chapter, you can earn points 50% faster! If you are military, police, rescue or a firefighter, you can earn points 20% faster! Your first rewards coupon is available at 100 points. Your rewards increase at each point level. You may choose to accumulate points over the course of the program period. Once you decide to redeem a coupon, the points will automatically subtract from your total. Motorcycle purchases and items in the bike deal are excluded from the Loyalty Rewards Program. Rewards points cannot be used towards the purchase of a motorcycle. 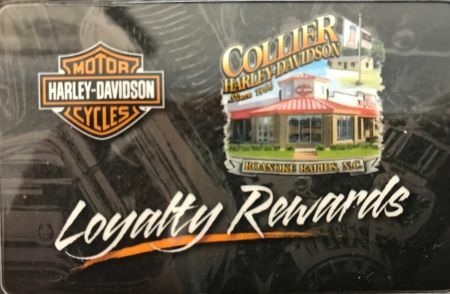 The Loyalty Rewards Program points expire if a purchase is not made at Collier Harley-Davidson® in a 365 day timeframe. There is a point cap of 10,000 points that you can accumulate before having to convert your points to coupons. Points are accumulated through purchases and special events and will be posted for purchases in 24-48 hours and special events in 48-72 hours. Your membership number and access code are on the back of your card right under the barcode (membership is on top in the format HJXXXX). Please note: if you are having trouble accessing your account, you may be entering zeros as the letter O and vice versa. Your membership number will only contain 2 letters followed by 4 numbers. Your access code located below the membership number may include a combination. Zeros are typically skinnier than the letters. You will then have an opportunity to establish a username and password to access your account. Customers may earn bonus points for special events and Collier Harley-Davidson® may feature bonus point days at its discretion. In addition, bonus points may be available from time to time for certain purchases. Points are automatically credited to your Loyalty Rewards account with each purchase at Collier Harley-Davidson®. Rewards are available 24-48 hours after purchase. For every bonus event your card must be presented for credit and will be available 48-72 hours from the next business day.Points earned with Collier Harley-Davidson® Loyalty Reward Cards expire if a purchase is not made at least one time in a 365 day timeframe. Loyalty Reward card can only be used by the original customer who joined the program or a member of their immediate household. Picture ID will be required and only the Collier Harley-Davidson® Rewards account holder may redeem points. Collier Harley-Davidson® Loyalty Rewards Certificates must be redeemed within 30 days of the print date and ID will be required. Employees of Collier Harley-Davidson® are not eligible for the program. Anyone with a store discount for any reason will not be eligible to participate. Collier Harley-Davidson® reserves the right to discontinue Collier Harley-Davidson® Loyalty Rewards Customer Loyalty Program privileges and/or void all or a portion of a member's point balance if points have been issued, received, or redeemed through human or computer error, fraud or theft, through illegal means, or in any manner inconsistent with the intent of the program. Collier Harley-Davidson® also reserves the right to modify or cancel the Customer Rewards Program. All points are given at the discretion of Collier Harley-Davidson®. Points can be changed, removed or added at any time and hold no cash value. Any or all discrepancies are decided by the Collier Harley-Davidson® management and the decision is final.